The Pino Digital Kettle Pro is temporarily sold out and will be back in stock shortly. If you would like to be notified when they are back in stock please added your name to our waitlist. A fast heating cordless kettle that holds temperature once achieved within 3% of desired target. Capacity is 50 ounces. Its one thousand watts of power will boil 2 cups of water in 120 seconds. The most recent release of this kettle is now finished with brushed stainless. 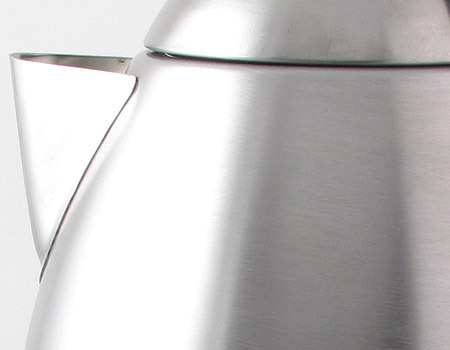 Cordless kettle that sits on a stainless base. Both Controller and water temperature display are in the base where they are exposed to much less heat than the controls been placed in the kettle itself. Will maintain temperature until it is turned off or it runs out of water. Has "no water" protection that turns the unit off if no water remains. Base is easy to clean. Water gauge indicates the water level in the kettle. Easy to realign kettle in base. Digital display to monitor and indicate the temperature. Set your desired temperature for water. Made from quality, thick stainless steel. 90 days limited manufacturer warranty.